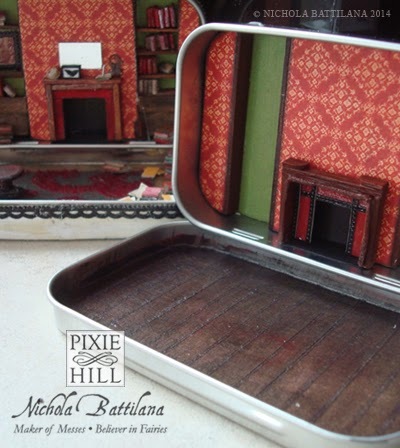 Pixie Hill: 221B Update: Fireplaces and Injuries! 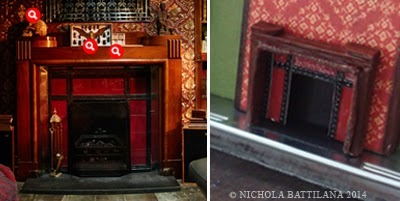 221B Update: Fireplaces and Injuries! After my little man went to bed I crafted my guts out... until 5 in the morning. It couldn't be helped. I was on a streak and it's been a long while since I pulled a late night. That work continued this morning, into the afternoon and here I am, 4:30 pm, in my jammas from the flurry of progress. The new fireplaces are done and I'm soooo happy with them. A vast improvement over the original (on the left). Far more detailed. And they are much closer to the BBC Sherlock set! Arwel Wyn Jones is the Production Designer on Sherlock. The more I look at the world he creates the more astounded I become. Such lovely, detailed work.... and the wallpapers are swoony! I am so smitten that I am contemplating spending my summer making a great big detailed miniature that includes ALL THE THINGS! Working on this tiny scale is fun, but it's also a bit limiting in a way. Anywho, amid all this fireplace flurry I managed to snip myself with scissors. If you don't count gluing my fingers together (something I do daily) then it's my first crafting injury of 2014. I'm surprised I've made it this long to be honest. Here's hoping it's another night packed with crafty action! Wow! Stunning. So sorry for the injury, but the work is appreciated! You are just having too much fun, except for finger snipping! !